RSSFilter uses rules to filter the items that are included from a feed in the resulting feed. RSSFilter supports RSS 2.0, 1.0, 0.9, 0.91, 0.92 and Atom 1.0, 0.3 feeds. 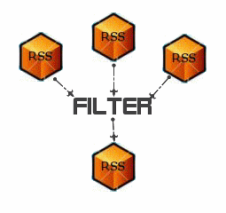 RSSFilter is designed to work with the other RSS scripts to help filter feeds. All of the RSS 2.0 item elements, plus the elements in the iTunes(R), TrackBack and Dublin Core extensions, are accessible for filtering. "Contains", "Does not contain", "Equal with", "Not equal with", "Begins with", "Does not begin with", "Ends with", "Does not end with", "Is Empty", "Is Not Empty", "Alphabetically Before", "Alphabetically After", "Before Date", "Before or On Date", "On Date", "After Date", "After or On Date", "Before Time", or "After Time"